Hi Fi Racks to launch Omnium8 at Munich High End Show | What Hi-Fi? The UK rack company designed the new modular, customisable range in response to ‘customer demand for additional product options’. These eight features include modular tier construction, hexagonal openings for cable management, the choice of two sizes (32mm or 46mm) and shapes (square or round) for the legs, and either the bolting together of tiers (as pictured) or their isolation with spikes. Like all of the company’s racks, the Omnium8 is made from solid oak, with each part handcrafted in the company’s workshop in Leicestershire. Each tier is 27mm thick. 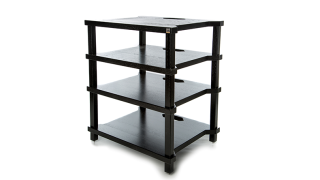 The Omnium8 comes in two standard tier sizes: 56.7cm wide by 46cm deep, and 100cm wide by 46cm deep. However, the Omnium8 can also be built to any size and any number of tiers, with any leg length available at no extra cost. There is a choice of finishes, including natural satin, mahogany, cherry, walnut, black or white. Pricing for the Omnium8 starts at £140.40 per tier. Full details will be available at the High End Munich Show, where it's being officially launched.